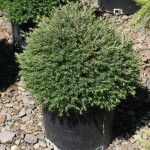 This will form a compact, pyramidal shrub with soft blue-green foliage that turns a bronze-plum in winter. The texture is quite fluffy in appearance, and will take well to light shearing. It prefers a moist, well-drained soil. It will grow best in full sun. Useful in foundation plantings or as a hedge.